When teeth are extracted, your body senses the loss and begins to resorb the bone that used to support those teeth. This resorption continues on for many years. When all of the teeth are missing, this resorption becomes quite serious. 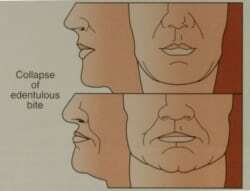 Almost the entire jawbone dissolves away, creating a condition known as facial collapse. Diagrams and photograph are posted courtesy of Dr. Carl E. Misch, the author of Dental Implant Prosthetics, the most widely used textbook on the subject. Here is a diagram showing what happens. The upper drawing shows a person with teeth. The bottom drawing shows the same person, a number of years after all the teeth have been extracted. You will notice the height of the lower face has decreased markedly, creating a look that we associate with aging. 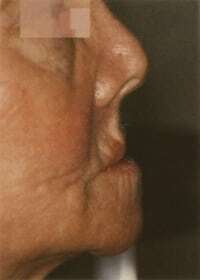 The skin of face develops deep folds. The upper lip has also sunken in. On the left is a photograph of an actual patient, years after all of her teeth were extracted. While the appearance of age created by facial collapse is a serious concern to patients, the most serious consequence of this phenomenon is not what you see in photographs. When this condition is advanced, as it is in this photograph, the person becomes a dental cripple who cannot retain a removable denture. This is why many people, once they are elderly, keep their teeth in a drawer, are unable to eat properly, and are embarrassed to be seen in public. Lack of good nutrition can complicate their general health, also. It is much easier to prevent it than to treat it after it occurs. Preventing it only requires the placing of dental implants to replace missing teeth. The presence of implants sends a signal to the bone that keeps it from resorbing. This is called the piezoelectric effect. Once facial collapse has occurred, the treatment involves rebuilding the jawbone with bone grafting. Dr. Thein is able to provide this service for you. Read more about his credentials. The happy news is that if you are suffering from facial collapse and are a dental cripple, unable to eat properly or retain a denture, your life can be transformed with proper dental care. In the hands of an dental implants expert like Dr. Thein, you can feel like you have your own natural teeth back. If you can relate to this and would like to know what your options are, call our office or request an appointment.